52 metres of cotton tape and 65 skeins of stranded cotton with 200 grams of dressmaker pins on canvas, many participants. 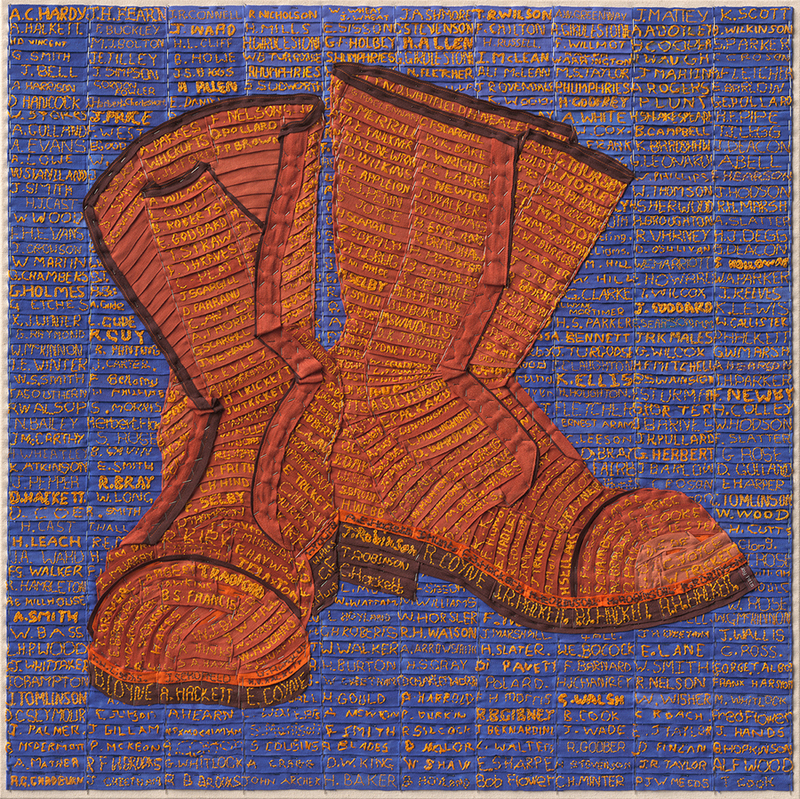 The names of 520 servicemen and women have been hand sewn and assembled on canvas depicting a pair of military boots. 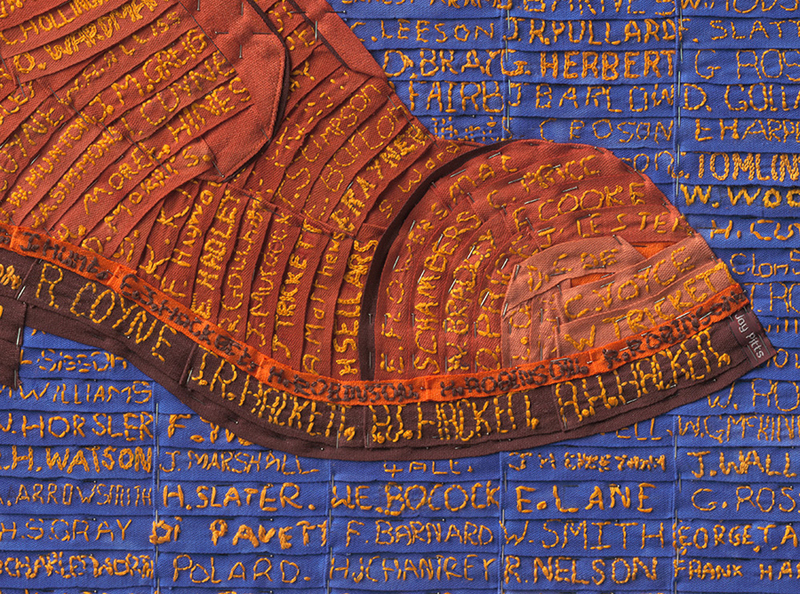 It is made up of 520 hand sewn nametapes of men and women who have served or are serving in the armed forces. 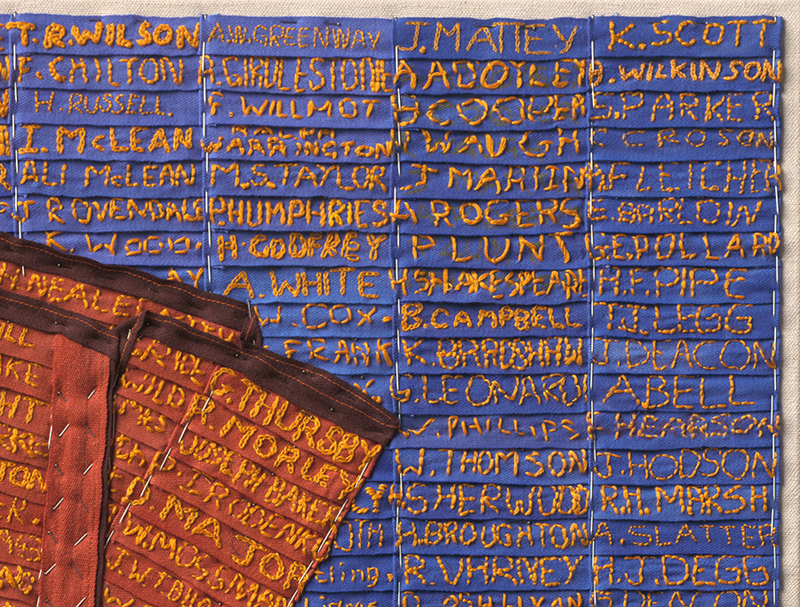 The nametapes were stitched by the soldier’s families, and by soldiers who are still serving now. Some of these named servicemen and women lost their lives and some survived. Where possible the 520 participants included personal stories about their grandfathers, fathers, brothers and uncles (see below). I learnt that it was not encouraged for family members to enquire after lost loved ones and that many photographs in family albums remain unknown. I launched the project with a call out to participate, following which I posted packs out with return postage for completed names. This project helped and encouraged families to carry out new personal research and to remember their loved ones by personally stitching their name. During WW1 it was common for both men and women to sew, repairing clothing at home and in the trenches. Military boots recalls these activities by inviting participants to create their own hand made acknowledgement to those who serve. Military Boots was specially commissioned by Nottinghamshire County Council. The Trent to Trenches Programme is part of the First World War Centenary Partnership, led by IWM (Imperial War Museums). Limited edition giclee print available 69 x 69cm. Click image to enlarge, see work in progress below. Thank you to all those that have participated in the project and included details about their family history, below are a few examples. William Shaw was my grandfather who served in the First World War in the Cheshire Regiment. His son, also William Shaw who is my uncle (now aged 90) served in World War II in the R.A.F. This tape commemorates them both. Captain Robert Hood Watson, Royal Engineers WWII, served in France, Italy, Greece and Burma. SGT. W.J. Baker. R.E.M.E. Born 1925 joined R.E.M.E. at 17 years 1942 – 1948 Second World War, died 1st Sept 2008 aged 83 years. Joseph Baker born in 1889 1st World War, father of W. J. Baker 1925 2nd World War. Joseph was gassed during the war but was lucky to survive although he had very poor health until his death in 1963. My 87 year old mother has embroidered two tags for your canvas, a brilliant idea Joy and we feel privileged to participate. One tag is in honour of her father Reginald Panting, and one for her uncle, Arthur Allen. Both served with the Sherwood Foresters in WW1 but sadly she never met her uncle, he died age 19 in Ypres. We will remember them. H. S. Gray – Royal Navy, died 01.01.1915 on HMS Formidable. G. H. Roberts – Royal Welch Fusiliers, served WW1 Palestine, survived, died 1956. H. J. Chantrey – Royal Marine, served WW1, captured at Battle of Crete 1941, POW in Stalag 18 for rest of War, survived, died 15.12.2013. L. H. P. Wood – Royal Navy, served after war, survived but invalided out, died 1990. M. Williams – Royal Welsh Fusiliers, served after the war, stationed in Germany, living. My Dad A. A. D’Oyley died in January 1993 aged 71. I knew about the crash, he was the front bomb aimer in a Lancaster, and the “bubble” broke off. He saw, he watched “his mates” die as he fell. When he got back to the UK he visited all six families of his crew as well as writing to tell them. I have only just found out that he was stationed at East Kirkby, Lincolnshire and just found out the names of the crew. I’ve been unable to find any other crews families. Thank you for this opportunity to remember them all, back as "mates", all the crew. Tom Wright who died in the First World War. Also for our friends son who joined the Marines this year in 2014 – Oliver Wardman. Thank you for allowing me to participate in this act of remembrance. My name tape is for my grandfather Arthur Thorpe born in 1886 who served with The Sherwood Foresters in WW1. He returned home safely but profoundly deaf from shell shock. He returned home to his wife and children and built up his business building and selling bicycles on Annesley Road, Hucknall. He is remembered with much love. Enclosed name tape J. Whitfield in memory of my great uncle John died 22/09/1916 and is buried at FLATIRON COPSE CEMETERY, MAMETZ. Thank you for allowing me to take part in such wonderful idea to commemorate our people who have or who are serving in the Armed Forces. Please find enclosed my embroidered name tape of my father who is now 88 but served in the Navy during WWII and was at the D-day Landings. After the war he joined the Army and served in Germany where he met my German mother. I was born in Germany and am currently researching my family tree. Many thanks for the opportunity to honour both my grandfathers. Claude Hollingworth is my maternal grandfather and was in the Essex Regiment – Army Veterinary Corps during WW1. He drove ambulances for the Red Cross in Nottingham City during WWII. Herbert Webb is my parental grandfather who drove the steam-engined trucks in WW1. Here is my fathers name tape; he was in the Pay Corps – so well back from the front line. His claim to fame was peeing in the next latrine to Monty! Percy Clarke, my unknown uncle, died in France on the 16th Feb 1916 aged 21. No. 20672, 10th Battalion Sherwood Foresters. Please find enclosed a name tape for my lovely Grandpa George Thursby. He was gassed in the War, but thankfully survived the horrors of the trenches and lived a full life. Thomas Reginald (Rex) Wilson died 20 November 1917 commanding a tank. He was 20 years old. My mother and I visited his grave. He is remembered at Trent College in the Chapel. Rifleman William Wheat of the King’s Royal Rifle Corps was killed in action on 21st March 1918 aged 27. He is commemorated on the memorial at Pozieres British Cemetery in Picardie, France. He was originally a silk worker in Coventry, having joined up in April 1916. His brother James, also a Rifleman with the King’s Royal Rifle Corps, was killed in action on 6th November 1918 aged 24. He is buried in the Premont British Cemetery in Northern France. He originally worked in a Coventry cycle factory and joined up at the outbreak of war. 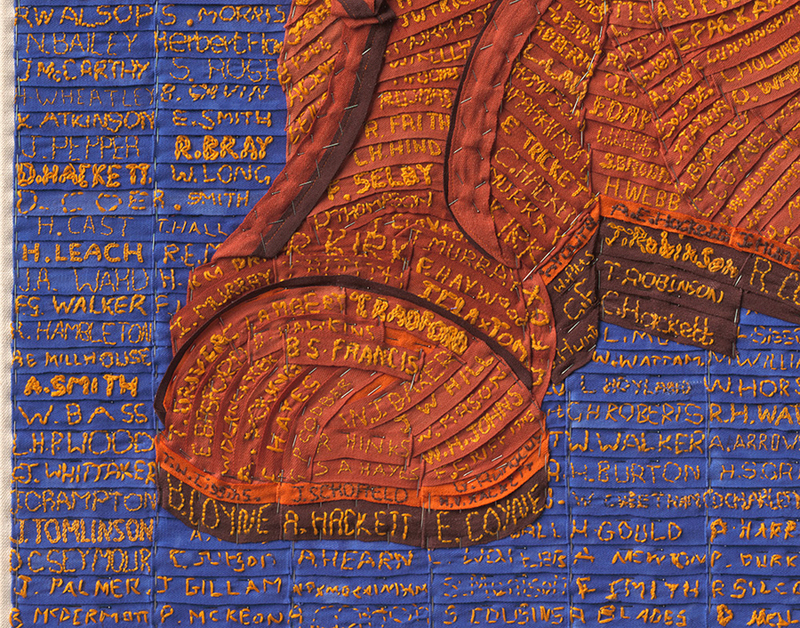 Although we never met our great-uncles, through family research and by commemorating them on the Military Boots name tape, we are able to bring them out of the shadows and remember them.